perhapablog... and other ramblings: comic book jones~! so, craig and i--along with sharon, trish, johnny and cat--had a FANTASTIC time in portland this past weekend at the Coast City Comic Con! got to hang a bit with that brian mulcahy--star of stage screen and pages 12-14 of the sensational new Perhapanauts:Danger Down Under! no.1--as well as our pals rich and alex woodall! got to meet a lot of really nice people--a whole mess of very talented art students! !--and, hopefully, a few new perhapanauts fans. thanks to jarrett and everyone who made the show a lot of fun! we had a great time! the fun starts at noon and if you're anywhere in that area, well...we'd love to see ya! 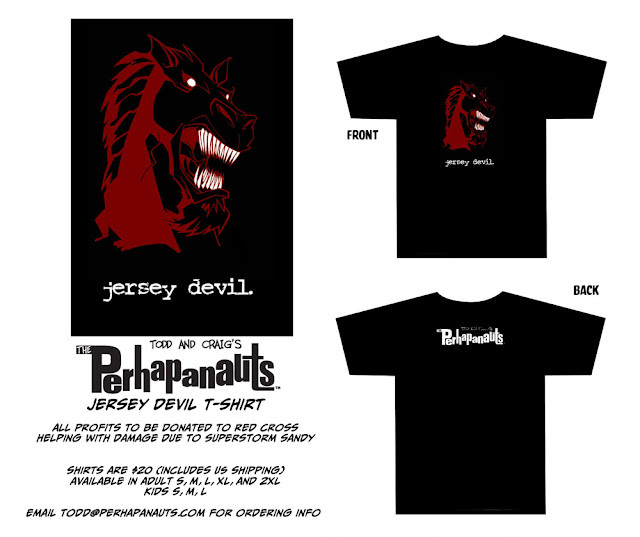 we are still taking orders for the exclusive JERSEY DEVIL/SUPERSTORM SANDY RED CROSS Relief T-Shirt, created by craig and worn by YOU! all proceeds go to the Red Cross to help them out in this time of need. As always, it was great to get to spend some time with you guys. Have a great time at the signing.